Both teams had reasons to be unhappy heading into the game, but for very different reasons. Manchester United were coming back of a comprehensive defeat away to Arsenal, picked apart with alarming ease within the opening twenty minutes, while the death of Everton legend Howard Kendall, who had featured first as a player and then later as a manager as part of Everton’s two greatest ever sides, had been announced that morning. One would inevitably be leaving worse off. The teams matched up in midfield – Roberto Martinez going with a 4-3-3 and Louis van Gaal a 4-2-3-1 – and started the game frantically, snapping around trying to close down their opponent. However, after a few minutes United sat back and took a more measured approach, immediately gaining the upper hand in the match. 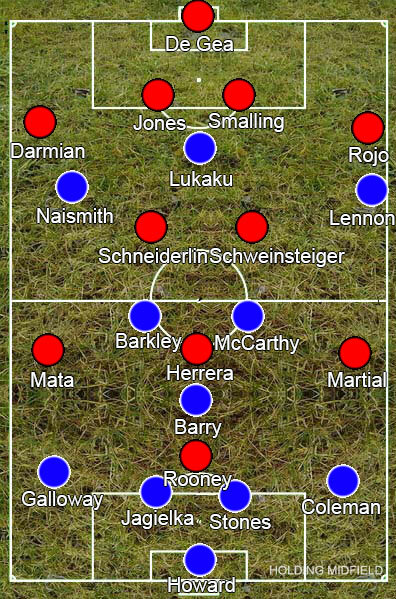 The main difference between the two teams was compactness. Early on in Van Gaal’s tenure United looked to man-mark their opponents in midfield, denying those players space but making it easy to drag them around and create gaps. Now they are better organised, defending zonally from front to back and keeping the lines close together to ensure there isn’t space to pass through them. 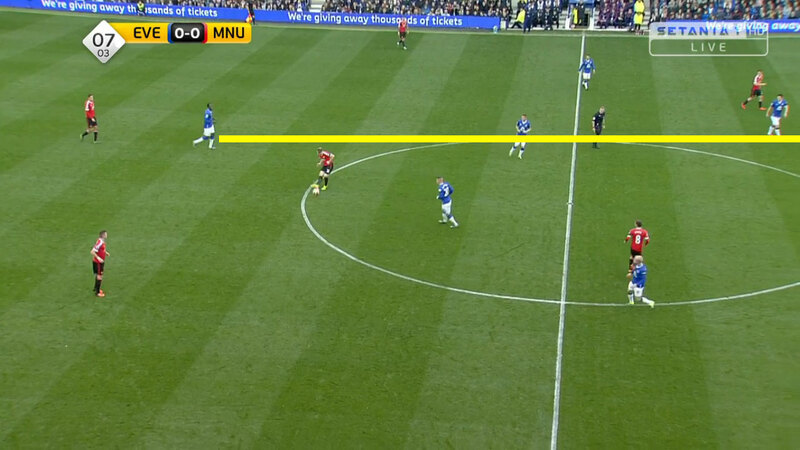 Everton, on the other hand, were far more stretched. 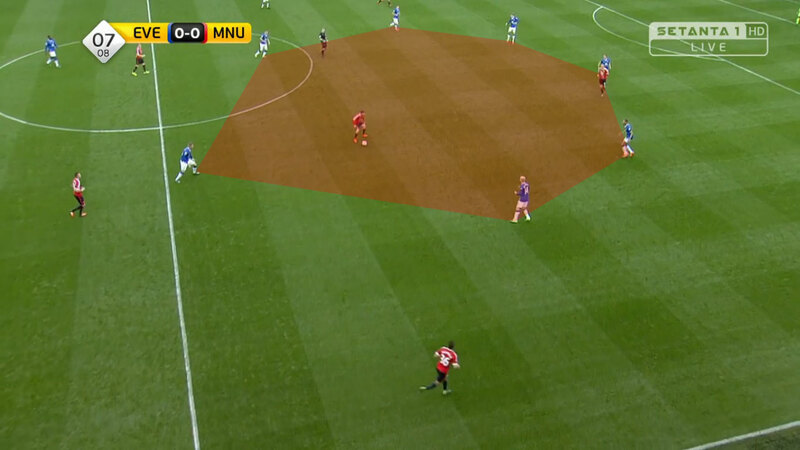 While Wayne Rooney and Ander Herrera would drop back and stop the ball being played into midfield, Romelu Lukaku rarely got back to shield his midfield. As a result, Everton’s midfielders would have to get much tighter to their men to deny them space, but opening large gaps to exploit in the process. 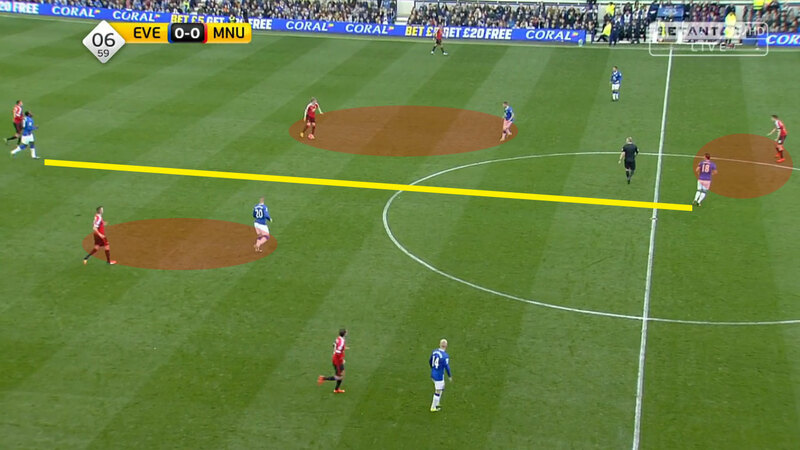 There’s roughly the same, if not more, distance between Lukaku and Gareth Barry here as there is between Rooney and his backline in the prior image. As the ball is played wide, Lukaku still hasn’t got back to defend and, while Ross Barkley and James McCarthy have eased off a little, there’s still plenty of space behind them, with Barry dragged off to the right sticking close to Herrera. As Barkley’s pushed up to press his man Morgan Schneiderlin, he’s left a massive gap behind him for Juan Mata to drift into off the wing, made even bigger by Barry’s failure to come across at all. Having Lukaku stay high up the pitch might be useful if Everton looked to get it directly up to him, yet they always looked to play it out patiently. Most teams in the Premier League aren’t anywhere near as well-organised as United, so Everton’s possession game can eventually open up gaps and win them the game. 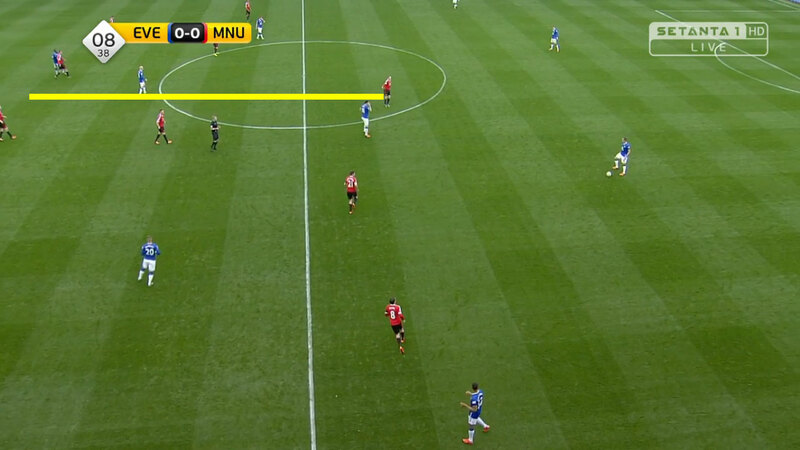 They are excruciatingly slow at passing the ball however, so a team like United who are actually competent defensively can simply shift across and cover wherever Everton look to attack and Everton won’t move the ball quick enough to punish whatever gaps there are. Everton’s most successful play was a clearly rehearsed move where the ball is played out to the left, laid off to Barry to hit first time to Lukaku, who would bring it down for Steven Naismith coming inside or occasionally the onrushing Barkley. They repeated this several times when their slow passing around the backline inevitably went nowhere and it rarely threatened as United were compact enough to close in around them, although it at least allowed them to get the ball forward. Lukaku was always pretty much guaranteed to beat Phil Jones and Chris Smalling in the air, but the tactic is reliant on the players around him winning second balls and making something happen quickly, as they still tend to be outnumbered by defenders. With a comfortable lead, United continued to sit back, using the pace of Anthony Martial and substitute Jesse Lingard on the counter. Martinez went more direct after the break, switching the fatigued Naismith with Arouna Kone and going 4-2-3-1 – McCarthy giving more defensive support to Barry while Barkley pushed up closer to Lukaku. The local lad’s form has picked up again after a difficult season last year, but it remains hard to tell where his best position is: he’s at his best when he can turn quickly and run at players yet that attacking midfield role has him with his back to goal too often, while he’s also clearly an attacker and the deeper midfield position has him having to knit things together at the base of midfield when you really want him threatening defences (plus he doesn’t really have the defensive awareness to play here). His technical abilities suit being stationed out wide, although that makes him much more predictable as he can only really move inside. Nevertheless the changes had no effect. Everton picked up in the second half but it was mainly due to United holding back, content with their lead.